Here’s what’s happening Today in the 914, according to Westchester Woman:?Westchester Women to Compete at Rio Olympics; Students Get Lesson on Government; Most Humane Prison in the World. 2.) Sen. Andrea Stewart-Cousins wants to all?of her constituents to participate in?Democracy. The best way to do that is to get them involved in the political process early on. ?Stewart-Cousins recently visited?the students at the John A. Coleman School in White Plains to talk about the purpose and function of government. Im always happy to speak with the students of the Coleman School about the importance of our Democracy, said Senator Stewart-Cousins. These students should know that their opinions matter, and that their representatives are here to address their concerns. 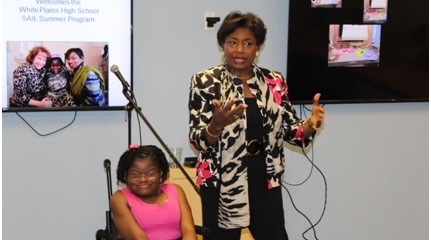 Stewart-Cousins met with 16 elementary students from the school, which serves medically fragile kids?and children with special needs to talk about the check and balances and the various levels of government, while hosting a mock legislative session. Students had to defend or support a bill that would require everyone to wear pink every day of the year. Your vote is your voice, Senator Stewart-Cousins told the class. Youre going to be impacted by whoever is elected whether you vote or not, so you might as well make your voice heard. 3.) Imagine if the American criminal justice system was less about retribution and more about?making sure that criminals don’t continue a life of crime. Norway says the way to reduce crime and prevent criminals fro re-offending is to treat prisoners like human beings. Some prisons in Norway, according to the Huffington Post, seem more like a country club?when compared with American jails. In Norway, prison sentences are about eight months, compared with 4.5 years in America, according to numbers from 2012. Their crime rates are low and the?recidivism rate is?20 percent. In America, 67 percent of those?who get out of prison end up back in within three years 76.6 percent in five years.